ANIMATE comes with a few default workspace layouts but when I am designing or drawing a character using imported bitmaps or jpegs, the imported images only show up in Camera View, not the Drawing View. Yes, it is possible to vectorize images into Symbols, then expand the Symbols to make them visible in the Drawing View (this is if you want to trace your scanned artwork) but if I only wish to use my imported jpegs as visual reference while I am designing or drawing, then it makes no sense to vectorize them. Francisco from ToonBoom offered a cool little tip - We can rearrange the modules so that both the Drawing and Camera Views are positioned side by side and visible at the same time. This is a great idea for Character Designing: I can draw in one window (Drawing View), and refer to the imported jpeg in the adjacent window (Camera View). *As we can't publicly display some of our work due to confidentiality agreements, this pic below is something I whipped up quickly for the purpose of this blog post. I imported the "Character Lineup" .jpeg which is what you see in the Camera View on the right, and represented as a Symbol in the timeline below. I do my rough drawing on the left in the Drawing View, which will then be cleaned up and colored. Note that the Drawing layer on the timeline is "hidden"/disabled so that it doesn't show up in the Camera View. I have the Lightbox enabled so that I can still see it in the Drawing View. Note also that I have shifted the Tool Properties, Color and Library modules over to the left side next to the Tool bar - this is just a personal preference. To move modules around, grab the tab and drop it wherever you want it to go. If you drop it ON TOP OF another tab, you will be able to toggle between these tabs in the same module. If you drop your tab ON ONE SIDE of another tab, then you will have separately-docked modules. If you drop your tab anywhere else, it becomes a free floating module. I don't know about anyone else, but the process of painting in ToonBoom Animate with Windows Vista O/S is still slow as hell. When I am choosing colors using the Color wheels, the program hangs and sometimes crashes. Solution: Disable Anti-aliasing in Open GL properties when working with color. I like my new workspace for character designing. When animating, I would switch back to the Default/Animation workspace. As always, some good tips. Francisco's a great guy... met him at the "More for Less" tour in Chicago. I'm going to finally install and use Animate Pro next week (just have to finish my storyboards for another project first) so I'm looking forward to taking a run at the program. I've got a little cheat sheet of tips you've pointed out here next to my tablet so I can stay on top of things. Hopefully it's a smooth transition. I'll let you know how it goes. It looks like a confortable layout for drawing. So, you use the lineup just as a quick reference, but you're not really "tracing" on top of it, right? You make a rough design based on the jpeg file, get rid of it and then clean up and color using just your rough. Am I getting that right? Stephen - We like Francisco! Yes, a great guy. We will also be installing Animate Pro so it will be interesting to see the difference. Yes, keep us posted! Wooot nice tut as always, a video screen caption would be nice also. But who am I to ask.. . Since I can't afford pro, do to the fact they don't have student discount for them. I'll be sticking with teh wegular.. . Will you's keep doing tuts for the regular Tb Animate..? Nice informative post, not just this one but ALL of them. I love you guys because you are both down to earth, despite your success and talents you give back by posting things like this when you really don't have to. So thank you. Just out of curiosity why are you switching to Pro? is animate non-pro not getting it done? Thanks Alex, we appreciate it. 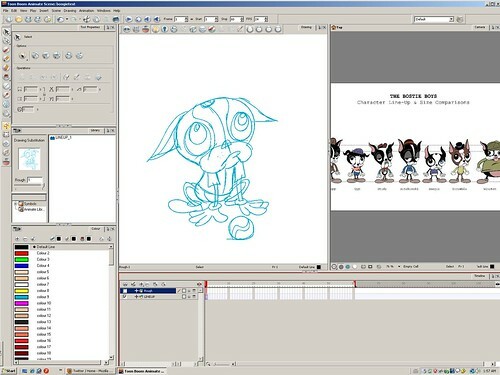 We're not switching to Pro: Toon Boom gave us the upgrade, but we are happy with Animate. We may check out Pro for evaluation purposes, but right now ANimate suits us just fine. Oh, makes me breathe a sigh of relief that regular Animate is good enough. I like the screen capture much better now, cause we can actually see what you are doing much better. Really happy about that. Thanks again, and Happy Holidays.